Tagged under Yoshihiro Togashi, Studio Pierrot, Series. The notorious Yusuke Urameshi dies while saving a boy's life in a car accident. Despite Yusuke's punk-attitude, he has a heart of gold, which prompt Botan (a beautiful girl who happens to be the grim reaper) and Koenma (the guy who decides who goes to heaven or hell) to give him a second chance in life - and spiritual powers! Alive once again, Yusuke discovers that he now possesses the "spirit gun", the ability to fire powerful energy blasts. With his new powers, Yusuke is dubbed by Koenma as the "spirit detective" to eradicate any evil that disturbs the balance between the human world and the spirit world. Together with Kuwabara, Kurama, and Hiei, Yusuke (along with his new powers) must destroy anything that threatens not only mankind, but also demonkind. It's pretty easy to watch this anime cause once you're in, you cannot leave it. Very funny and entertaining even the fighting is good. The relationship between characters gets stronger during the anime., and it's so solid that it makes you want to be a part of it. And there's also time for love... just one couple at least one that is real. Maybe there's some suggestion on other possible couples, but they fail to be. Even so, the one real couple is weird... they don't seem to fit together. But in the end, the viewer sees that their relationship can not end any other way. They are meant to be together no matter what. Strongly recommended, this anime will make you have a good time. And once you finished it, sure you'll begin it again. 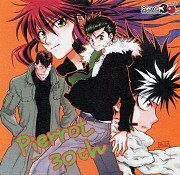 I enjoyed this particular shounen series as it isn't too long or too short, it was just right and kept me interested. Although the tournament arc was my least favorite and it dragged on too long. Shinobu Sensui is my best villain of YYH, I liked how his character was developed. I didn't care for Younger Toguro though, he was too OP for me. The best ship in this series is Hiei x Kurama, they have the best chemistry and the worst is Kuwabara x Yukina. I prefer to ship Yusuke x Botan more than Yusuke's canon relationship with Keiko, I enjoyed the chemistry Yusuke had with Botan best. The second movie was great and it was very engaging to watch, Kurama's former partner Kuronue was hot and the animation for it was truly well made. I also loved the ED song by PERSONZ as well. I think it's a great shonen show. Me and friends enjoyed it very much. The whole cast is awesome! And even the side characters are well written. This was a fun series to watch (despite the every once in a while annoying character, namely Botan or Koenma/Jr.). More back story and complimentary action with the demon world, Raizen, and the other two rules, Mukuro and Yomi, would have been nice. This is this the best anime that I've watched with the most satisfactory fighting scenes, it's better than bleach, fairy tail and the other anime. This show was great! it was one of the few that I started with when I first say what anime was. It was a good one too watch too though I didn't understand much at the time. I need to watch it again sometime soon. Haha, one of my favorite. I always feel excited when it comes to his team's battle, it's always something you look forward to. XD Thou the graphic aren't really the greatest, the plot and humor always manage to keep you satisfy. Even if it's basically the same fighting plot of Saint Seiya, this one has more action "outside fights", and I just love to see the personal lives of my favourite characters. I'm still buying the dvds to complete it. I also own the complete manga of this one, very good. 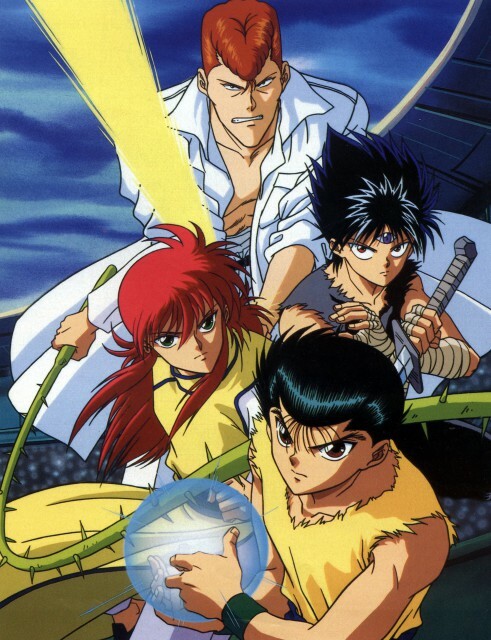 Altought a little old, Yuu Yuu Hakusho is the anime that was claimed to be the successor of Dragon Ball. Well, in my opinion, it's better than Dragon Ball, not only the plot but the drawing and the characters. It is not a long story, just 19 volumes and 112 episodes. Personally, i think that Yuu Yuu Hakusho has a very well-developed plot and it's easy to follow. There's not a lot of mysteries so the connections that are established between arcs are clear and simple. If i'm not wrong, the final arc in the manga has its version in the OVAs, called "Eizou Hakusho". About the characters... in a way, they are stereotypes. Even thought, there's a underlying originality that makes them unique and charismatic. Throughout the story, they are constantly changing, they do evolve. At the end, even being themselves, they have a little bit of one another. Their powers are really strong, even at the beginning, but due to an accumulation of circumstances, these powers are asleep. Not until the end do they awake. All in all, is a good show, and very funny too. I'd have to give credit for this series because it piqued my interest in anime! I never got tired of watching it no matter how many times it re-airs. Every season got me sticking and wanting to know more on what would happen next. It's also amusing that it's fun to sing along with its opening theme and ending songs. YYH is definitely one of those all-time favorite anime series worth watching. I only own the OVA, which was alright since they used different voice cast. But anyway, the series was more better! I liked the action and animation. This is one of those series that you gotta keep watching. I loved how Yusuke's last form turned out, so creepy and cool. I'm glad I watched this series - purely awesome and the music is great too. The last couple seasons were not the best, but over all this was one of my favorite anime. I first saw it about half way though the second season but ran into the trouble of it only being in RAW Japanese. Then later I found a site that has a lot of anime free to watch and saw it all the way through. I loved this anime the character though a bit predictable mesh really well and the show really keeps you in suspense. I will probably watch this again someday, but my list of anime that I want to see, has grown exponentially over the past few years and it will probably be a while before I will think about of revisiting old favorites. A action classic, the story follows the life and experiences of a deliquescent named Yusuke Urameshi. He dies and to regain his life he must undergo tests of character and endurance. Sums up about the first few episodes then the actually plot takes place blows away viewers with outrageous battles, techniques from Yusuke and crew and a pretty good plot. Highly recommended if ghosts, demons, and fighting is your thing.